Artist Dawn Patel in her Egg Harbor gallery and eco-tique, Brillant Stranger. Photo by Len Villano. Dawn Patel remembers the scene vividly: yards of organic linen and silk blend fabric lying on her driveway, the bleach she applied in intricate patterns eating away at the delicate and expensive material. It was the only fabric she had to work with, so Patel gathered it up and brought it inside. A cold-water rinse halted the destruction and revealed the shredded cloth; its intention to become a line of simple, black, small-batch dresses destroyed. But what spelled the end of one project marked the beginning of another for Patel, the artist and clothing designer behind Brilliant Stranger gallery in Egg Harbor. Drawing on two important parts of her artistic portfolio — upcycling and layering — Patel backed the shredded fabric with a vintage sari (a long piece of cloth traditionally worn wrapped around the head and body by women of south Asia). With a few stitches here and faux leather vinyl backing there, Patel created a line of wearable art that instantly resonated with those who viewed it. “I started making it and immediately had this really positive response, something I’ve never had with my art my entire life,” Patel said. 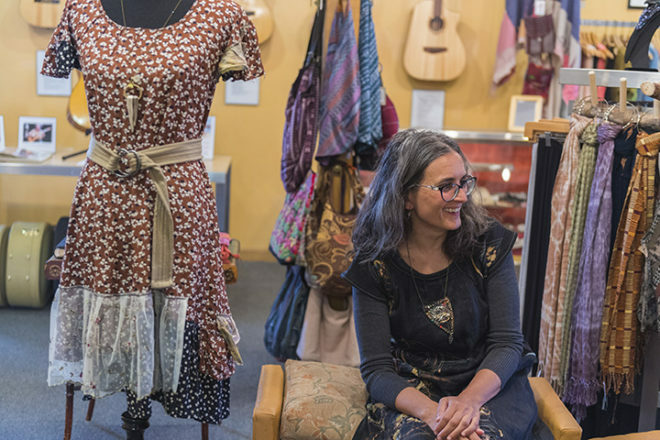 It has been a year since that serendipitous accident, one that has seen her Ancestry Cloth — the official name of the garment and accessory line — in the gift shop of the Museum of Wisconsin Art and in a glossy spread of Belle Armoire magazine, a West Coast publication showcasing wearable art and handmade fashions. It is only through tearing at, reconstructing and embracing imperfection that Patel has built a successful life as an artist. In many ways, Ancestry Cloth has become a metaphor for her life’s work. 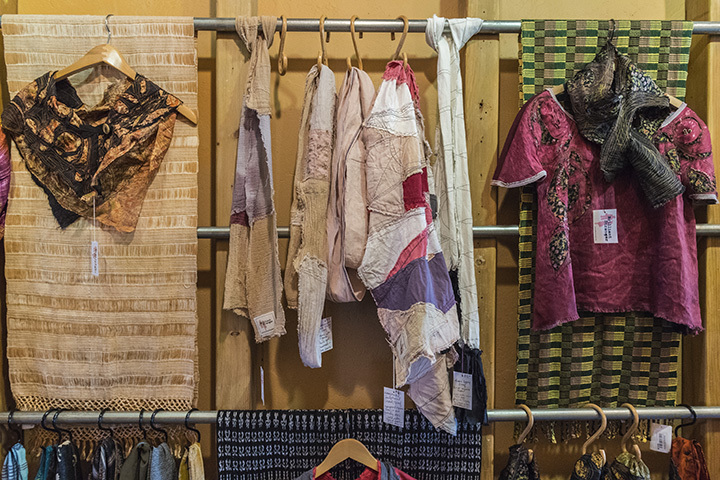 Dawn Patel’s handcrafted garments at Brilliant Stranger in Egg Harbor. Photo by Len Villano. Following her decade-long history on the peninsula’s art scene — from operating the first Brilliant Stranger shop in Fish Creek from 2006 to 2013 before taking a three-year sabbatical to focus on painting, finally reformulating her business focus and reopening in 2016 — it’s clear evolution is an important part of Patel’s artistic vernacular. The newest incarnation of Brilliant Stranger is, in Patel’s view, the truest reflection of her ethics and values. Neighboring the Greens N Grains Natural Foods Market & Café on one side and the eco-friendly Spa Verde salon and spa on the other, the boutique carries Patel’s eco-clothing and accessories, handmade guitars by Patel’s partner Dale Kumbalek, and a selection of Guatemalan textiles, organic cotton clothing, and locally-made jewelry curated by Greens N Grains owner Kathy Navis. Brilliant Stranger is the embodiment of Patel’s beliefs. An advocate for civil, environmental and women’s rights, she has found a way to champion the needs of these groups through her art and time. She supports Himalayan garment workers through her collaborative line of Nepalese cotton clothing, which Patel orders raw and unfinished from a fair trade company then dip dyes and block prints with her own original designs. All of the supplies she uses to create her artwork are either organic or salvaged, like the old door from Brilliant Stranger in Fish Creek, which was repurposed by Dale into a frame for one of her layered acrylic paintings. 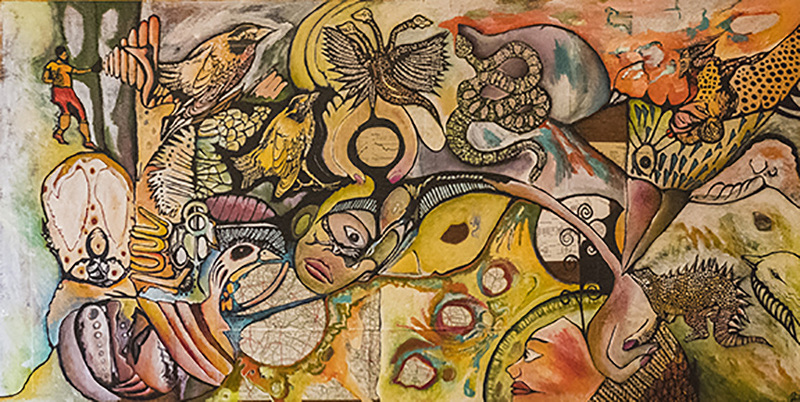 These acrylic and mixed media paintings, which decorate the walls of Brilliant Stranger and Lost Moth Gallery in Egg Harbor, celebrate the visions that have always been an important part of Patel’s artistic process. They often speak of the relationships — both the connections and tension — between man and nature, and seek to reflect back at society. “The Bird Without Feet” mixed media painting by Dawn Patel. Patel also hopes to help people surrender to art in a different way: by giving them an opportunity to explore their creativity through the opening of a second Brilliant Stranger, which opened in the summer of 2017 in Sister Bay. Tucked among a trio of gallery and studio spaces in a garden courtyard off Bay Shore Drive, Patel’s new space carries her handmade creations along with art kits and informal walk-in art activities, from watercolor painting to block printed t-shirts. In every fiber of her clothing and being is a desire to help those she meets unearth their personal treasures and meet the beautiful stranger within. For more on Dawn Patel and Brilliant Stranger, visit brilliantstranger.com.